BROOKLYN, New York (WTVD) -- Behind Luke Kennard and Jayson Tatum, No. 14 Duke overcame a double-digit deficit to beat No. 10 Louisville 81-77 on Thursday and set up an ACC Tournament semifinal showdown against rival North Carolina. The fifth-seeded Blue Devils (25-8) will play No. 1 seed North Carolina for the third time this season at 7 p.m. Friday at Barclays Center. The old rivals split their regular-season matchup, with each winning at home. ACC leading scorer Kennard had 24 points to go with 10 rebounds. He made big shots down the stretch for Duke and hit a free throw to seal the final margin. The sophomore's 3 with 4:45 left in the second half gave Duke its first lead, 73-70, since the end of the first. Tatum's 3 with 2:20 left made it 78-73 for the Blue Devils. Tatum led all scorers with 25. The freshman also added six rebounds and three steals. Grayson Allen rebounded from his zero-point effort Wednesday against Clemson with 18 points, his best outing in a month. Against Louisville, Allen, who has been nursing a sore ankle, played like his old self. He was booed by opposing fans every time he stepped on the floor, especially with so many North Carolina fans scouting out their next opponent. Duke fans - and there were plenty at Brooklyn's Barclays, too - would try to drown it out with cheers. Allen was fouled shooting a 3 with 8:58 left, a call that got about equal parts boos and hoots. As he shot his free throws, there were boos. After each make, cheers. He cut the lead to 64-61 by the time he was done and then went to the bench where his teammates all got to their feet to greet him with hand slaps and pats on the back. With the victory, Duke coach Mike Krzyzewski passed UNC coaching legend Dean Smith for the most all-time wins (59) in the ACC Tournament. Deng Adel scored 21 points for fourth-seeded Louisville (24-8), which led by a dozen with 13 minutes left but struggled from the free-throw (15 for 26) and 3-point lines (4 for 21). Still, the Cardinals had a chance to tie it late, but Quentin Snider missed a shot with 4 seconds left as he leaned into a defender trying to draw contact. 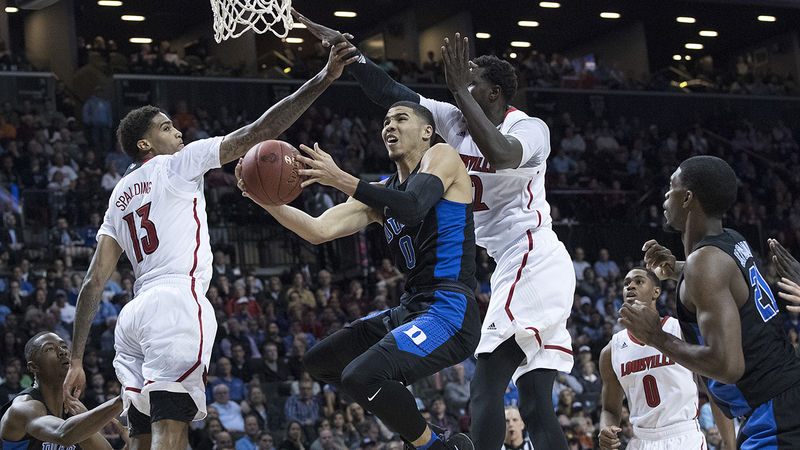 The Blue Devils played mostly with just six players, they dealt with foul trouble for Frank Jackson and were still able to rally against a deep Louisville team that thrives on tenacious pressure defense. This was just Louisville's second ACC Tournament game since joining the conference three years ago. The Cardinals were one-and-done in their first ACC Tournament in 2015, followed by a self-imposed postseason ban because of NCAA violations. Another one-and-done should eliminate any outside hopes the Cardinals had of grabbing a No. 1 seed in the NCAA tournament.